Wicked Campers – All in the Family? “LEANNE” (Stuff News photo above) – John William Webb’s son Liam Webb has spoken on behalf of Wicked Campers before, as “Leanne Webb” Wicked Campers slogan outrage continues. Wicked Campers founder and owner John William Webb, father of “LEANNE” has been silently defiant in the face of the latest uproar over his vans’ slogans. The son “LEANNE” Webb is now the focus of media attention. John Webb, has spoken up in defence of his company in the past but this time he has avoided media, deciding to keep quiet.. 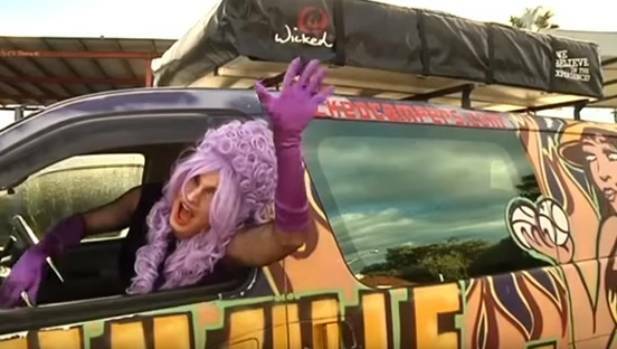 The Australian Business Register (ABN) records show Brisbane-based Wicked Campers is registered under the name The Trustee of the Juicy Love Trust. The company was first incorporated in October 2006.